As an enthusiastic social marketer, what can you do to encourage your associates, customers and business partners to embrace social? 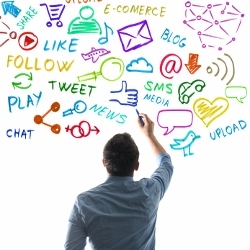 Consider adding social media to your next customer event! Joining a social network with others is possibly the best way to experience social. That's how I got started. The people I met when I started blogging in 2006 became the people I experimented with on Twitter and Faceook. And a group of us who took part in Blogger Social in 2008 used these tools to organize the event, keep up with details and share highlights. Since then, Twitter in particular has been a valuable tool for enhancing the marketing events I participate in - e.g., MarketingProfs B2B Forum #MProfsB2B, Columbia Business School's BRITE Conference #BRITEConf, HubSpot's Inbound Conference #INBOUND as well as online webinars and training events. That addition of social media to the event helps it go beyond the immediate time and space confines of the event. It starts sooner, lasts longer, gets shared and amplified and it creates greater loyalty for all those participating - even remotely. Why is social media so difficult on your own? It can be really hard to get started in social media on your own. Initially once you set up your Twitter, Facebook, Pinterest or even LinkedIn account - whether for yourself or your business - you have a blank canvas in front of you. There's nothing more anti-social and stiffling than a blank screen. The social part happens when you start to find people you care about - and who are willing to interact - to follow. That's why many social networks ask to connect with your existing social profiles or your email account to determine who within your immediate circle you might connect with. That's a good beginning - for your personal account. What about for your business account which tends not to come with a posse of friends, fans and supporters! Looking for well-known personalities, with big followings, usually means little responsiveness to your updates. Rather, you're on the receiving end of broadcast messages that had better be interesting! Searching for companies you know - suppliers, brands, businesses in your space - may yield profiles. Sadly, many will be on autopilot, posting the same message on several networks and not paying much attention to your tweets or updates. Those that do respond and interact are ones you must treasure and nurture zealously! Seeking out co-workers and business associates may identify those who would rather not be social after hours or beyond work responsibilities. However, if they get it and interact with you, be sure to acknowledge them as they will become your company's more priceless allies! Researching topics and keywords relevant to your business may yield little meaning or too much information. As you come across relevant topics and updates, monitor common search terms or hashtags (i.e, #topic). On the subject of hashtags, be on the lookout for terms associated with an event you admire or which is relevant to your industry. When you notice interesting tweets, consider following that person and exploring his/her following further. Then, try to meet in person at the next event and solidify the relationship. To help illustrate how powerful Twitter is for bringing to life events, check out NRF 2014: The show floor, in tweets and vines which reminded me of my virtual participation in NeoCon - see I attended NeoCon... Virtually! And there's Tile Industry at Coverings 2012 via Tweetup, Twitter Chat, Trends. Finally, as you become more familiar with the social network, be persistent and observant, commit to contributing valuable content relevant to your industry and area of expertise, and be sure to mind your manners! Acknowledge, follow back and be human. Find at least one Twitter chat event to participate in. You'll learn a lot from the experience. Adding social media to an event can be impromptu. 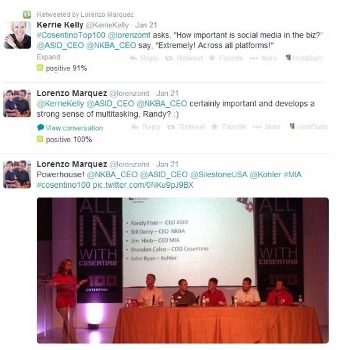 Take the recent Cosentino 100 Summit when Cosentino VP of Marketing Lorenzo Marquez used Twitter to share photos of an industry panel and identify the panelists. Event attendee Kerrie Kelly used #CosentinoTop100 to highlight a question and responses from two of the panelists. The overall effect from adding social media to this customer event highlighted a strong desire to share, collaborate and jointly celebrate the interesting, the fascinating, and the fun with others. It also reinforced the sense of welcome and collaboration expressed throughout the event. How to make your event more social. Identify a hashtag and share it ahead of time, if possible. List your participants' Twitter handles with the event attendee list. Identify Twitter handles on participant badges. Encourage participants ahead of time to install a Twitter app on their mobile device and set up a search stream for your event hashtag. During the event, take photos and include the event hashtag and people's twitter names when you share the photo (as Lorenzo does in the image above). Identify people ahead of time to set the example and share tweets during presentations (as Kerrie Kelly is doing above). Encourage tweets during presentations by mentioning Twitter and the event hashtag at the beginning of each presentation. Add the hashtag to the footer of each page on overhead presentations. Invite questions to be submitted via Twitter. Then answer them. Create a Twitter list of those who participated during the event and proactively interact with them after the event. Mention Twitter in your traditional event follow up communications. What do you think about making your next event social? How do plan to make it happen?